The Ready to Wear show for s/s 2011 was yesterday night in Paris, France! Oh to be able to attend one of these would be a dream come true, but these pictures of the attendees will suffice for now. You can view the runway slide show on Vogue. Click here to view the guest photos on Zimbio. Click here to view some of the photos from the last runway show f/w 2010. Expectant Miranda Kerr (wearing a Motorcycle jacket) and husband Orlando Bloom. Even though Balenciaga has decided to release Giant Gold Hardware in very limited amounts, they have designed an interesting leather/hardware combination: classic gold hardware and "cross-shaped slit" perforated leather! Matches Fashion has gotten this in the Work style in Anthracite! My take on this new variation? I'm not so sure about the larger perforations, but I would like to try this in a City style. I'd probably play it safe by getting the black with gold. I would also like to see them release this hardware with the traditional leather. The regular Perfo didn't seem to be that great of a hit, as certain colors were seen in major clearance stores. 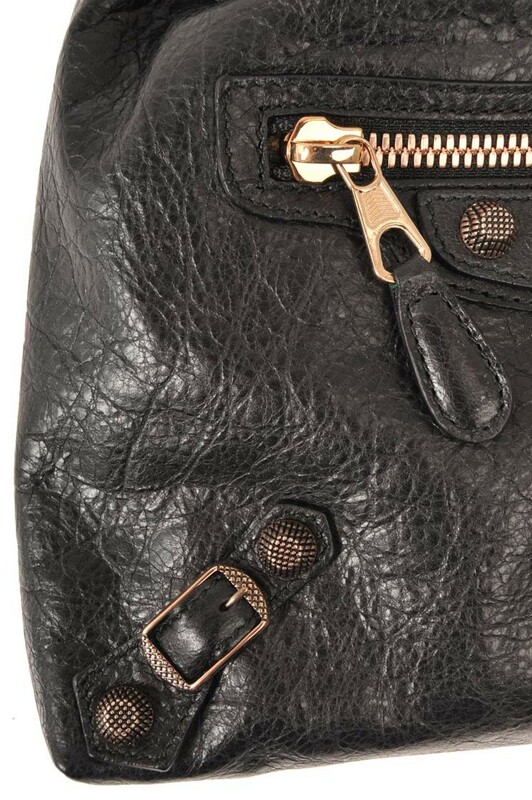 Click here to see the other styles that Balenciaga has previewed on their website. 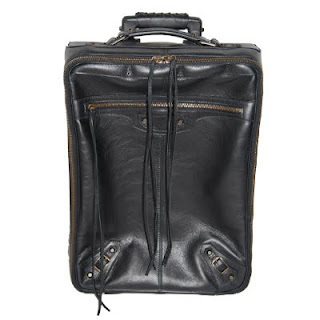 Balenciaga has recently decided to release some interesting pieces of roll on luggage. 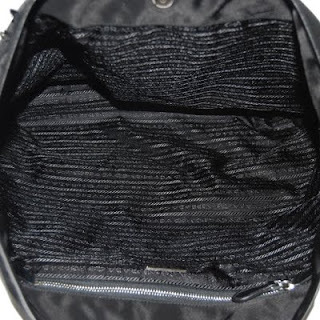 I was able to find some nice detailed picture of this roll on bag. The Balenciaga website calls it a "Classic Carry On" since it has the traditional Motorcycle line characteristics. I like it, but it is not for the budget conscious. Of course it would be great to travel in style with Bal luggage, but it is also not practical to get them all dinged up going through the airport/airplane with it. Usually my choice of suitcase is from Macy's where you can get several pieces for less than $100. Even if I did have the extra cash, I would drop it on another handbag rather than luggage lol. More posts on luggage here and here. A pretty old pic of Ashley Olsen that I saved on my computer a long time ago (sorry, can't remember the source). This is one of my favorites because in this pic she makes an all black outfit look so rocker-chic and cool. 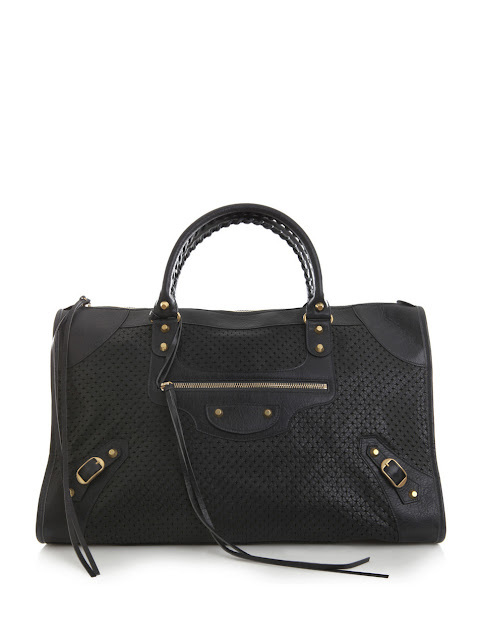 She wears a Balenciaga black work bag, and sky high Louboutin pumps. Stunning! To shop Ashley's outfit: click here for LNA top, here for similar trousers by JBrand, here for similar Louboutin shoes, here for similar belt by Balenciaga, here for similar sunglasses by Gucci, and here for similar bag by Balenciaga. 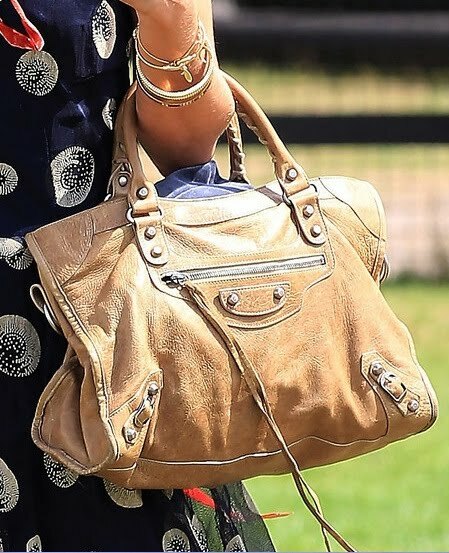 As you all may know, Nicole is probably one of Balenciaga's most devoted fans! She was spotted yesterday on September 20, 2010 landing in Los Angeles after a birthday celebration in Mexico. Christina Aguilera and Samantha Ronson were also there too. The fashionista turns 29 today! 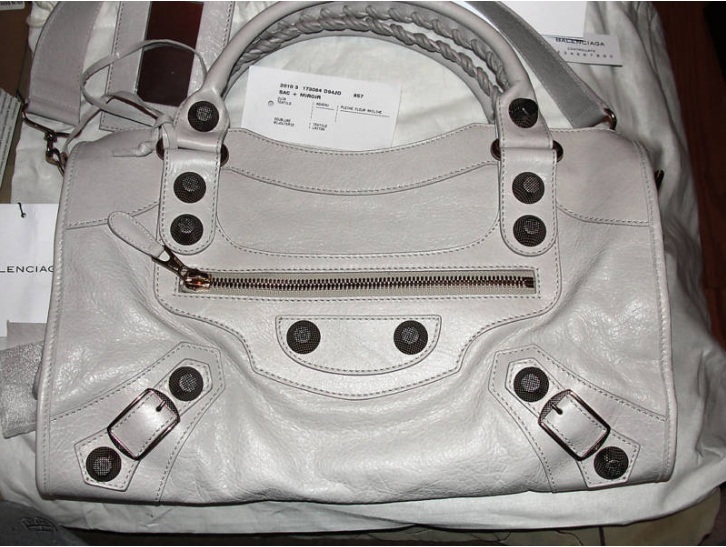 I don't think I've seen her carry this Balenciaga bag recently, but it looks like a White City? Can anyone else chime in? She looks very relaxed wearing a purple floral cover up. To shop Nicole's look: click here for a similar cover up, here for a similar hat, here for similar sunglasses, and here for similar bag. I thought these celebrity sightings were worth posting about especially since they are vintage Bals! Sara Paxton carrying 2006 pony hair First, taken July 8, 2010 at the Darker Side of Green Debate in Hollywood, CA. To shop Sara's look, click here for similar blazer, here for similar top, here for similar jeans, here for similar shoes, and here for similar bag. Cat Deeley carrying a beautiful 2003 Pewter Hardware Caramel City! Taken July 25, 2010 at the Guards Polo Club. Nicole Scherzinger was spotted yesterday September 14, 2010 after landing in London's Heathrow Airport. She looks amazing for someone who just go off a long airplane ride. Though the S/S 2010 Linen City bag may not be for everyone, she surely knows how to work it into her outfit and make this bag look good! Hey, I actually kind of want one now because of her! The best part of her outfit has to be that gray leather jacket! It gives her a cool rock n' roll vibe. To shop Nicole's look, click here for a similar fedora hat, here for similar aviator sunglasses, here for similar jacket, here for similar cardigan, here for similar tank, here for similar leggings, and here for similar boots. To shop Amber's look, click here or here for a similar sequin jacket, here for a similar tee, here for similar jeans, here for similar pumps, and here for similar bag. This is taken a couple months back in July from the Style and the City blog, but it is a really pretty picture worth blogging about! She has probably given birth to her baby by now, but I'm still admiring her maternity style! If I ever am expecting another one, I will attempt to take some fashion cues from her. Of course her pregnancy outfit consists of a Balenciaga First bag and beautiful Balenciaga sandals. The sandals I've noticed without interest before, but now seeing them on her, I have to do a double take. Everything looks good on this girl! I love that the colors of her outfit matches exactly to her shoes - brown, white, and black! 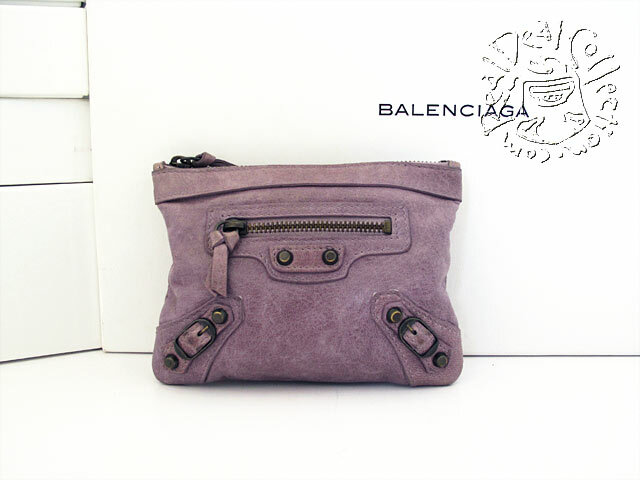 Shop here for Miro's Balenciaga sandals, and here for her Balenciaga bag. Rumer Willis was spotted on Friday, September 10, 2010 carrying a new bag from this season: a F/W 2010 Vert D'eau Velo! She and her boyfriend were outside Urth Caffe in Los Angeles waiting for valet to bring their car around. Let's talk more about her bag. I initially had my reservations on such a light and unusual color. 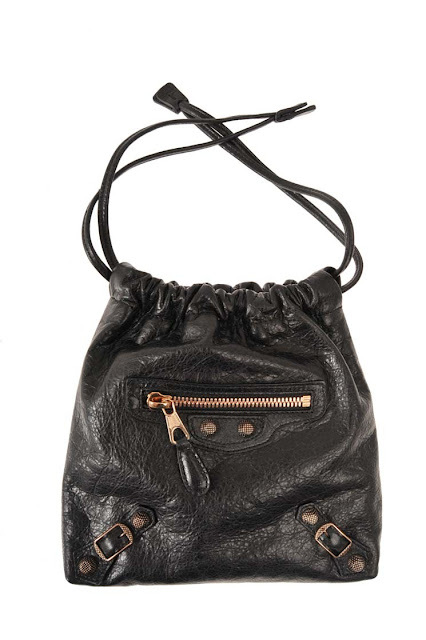 I was wondering if this would be a bag difficult to pair with clothing, but boy was I wrong after seeing this on Rumer! It can turn any simple, neutral outfit into a fun and colorful look. 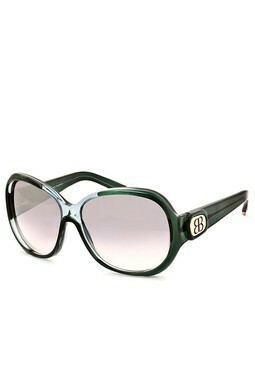 To top it off, she also slips on a yummy pair Balenciaga flats to match. Might I add, I still want a pair so badly, but I refuse to fork over $550 for shoes! To shop Rumer's look: click here for a similar cardigan, here for a similar tank, here for similar jeans, here for similar sunglasses, here for similar necklace, here for the Vert D'eau Velo or here for a similar bag, and here for the exact shoes. Images via I'm Not Obsessed. Stephanie Pratt was spotted yesterday on September 10, 2010 taking a stroll out in Beverly Hills, CA. The Hills star has told the press that she has not spoken to brother Spencer for almost a year! Despite her sibling drama, she appears to be all smiles in these pics. Stephanie looks relaxed and cute in a baggy striped top and worn out jeans. To top off her casual look, she wears her lovingly used red Work bag. To get Pratt's look, shop here for a similar top, here for jeans, here for flip flops, here for similar sunglasses and here for a similar bag. So this new style has started to trickle into stores. The first store that is spotted to have this interesting style is Alduca Doasta which is a boutique in Italy. They are selling it for 279 Euros ~$357 USD, but is already sold out after being on the site for a day! This one looks like the version without the shoulder strap, and is measuring at 19 x 19 x 4 cm (7.5" x 7.5" x 1.5"). It looks really beautiful with rose gold hardware. I think this style would probably suit me better than the coin purse I am using right now. My CP is filled to the point where it looks like its about to explode. The cross-body one is called the "Move On" where it comes with a messenger strap. 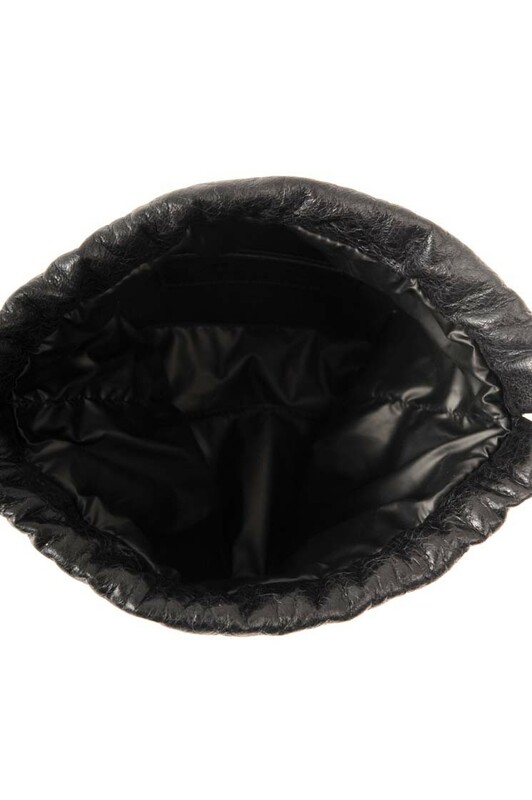 Instead of traditional black cotton lining inside, it looks like they've used some type of waterproof lining instead. This is a very smart idea especially if this used as a make up case. Good to know Bal has their thinking caps on! This is a must have for me, but when? I'm not so sure yet.. I still have my heart set on the Spring 2011 colors. I haven't yet purchased from this boutique, so I'm not going to put this on my reputable store list yet. I would like to see if purchases would incur any other customs/duties fees on top of the ones they already charge. It appears to be legitimate though. Cult Status did a blog post on the color Nacre with a few informative comparison shots of the color. I think it looks kind of dingy with the silver hardware. This is a nay for me, but perhaps it is prettier in Rose Gold Hardware? Has anyone purchased Nacre with RGGH yet? This combination is very pretty, I can see the gray undertones in this one. The RGGH Nacre City below is still available on ebay for $1500 from a reputable seller. I can see this as being as the less popular color. Light colors are beautiful in my opinion, but they can be difficult to care for at times. 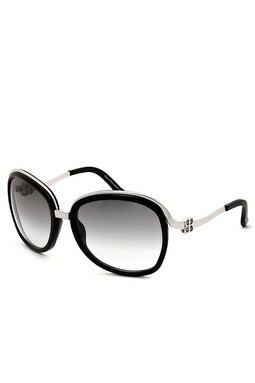 The sale for Balenciaga sunnies are about to start on Hautelook! Click here to check it out, or here if you need a Hautelook invite. Email them love@aloharag.com if you're interested, or me if you would like me to forward you the pics. Now take $50 off any item already discounted in the "SALE" category at Real Deal Collection! Use coupon code 50OFFSALE in the shopping cart at checkout. Be sure to click the "Apply Coupon" button to adjust your order total. Only one coupon per order. Coupons cannot be combined or applied retroactively to existing orders. Hurry! This coupon expires on Tuesday, September 7th at Midnight, Mountain Daylight Time. 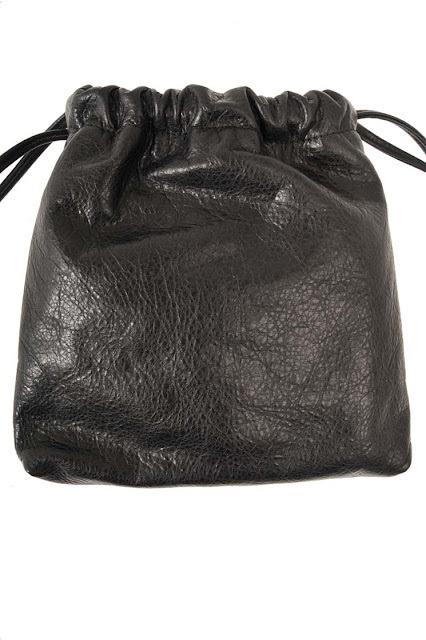 Click here to browse bags that qualify for the $50 extra discount. Kim Kardashian was spotted getting her hair done at the Neil George Hair Salon in Beverly Hills, CA on September 1, 2010. 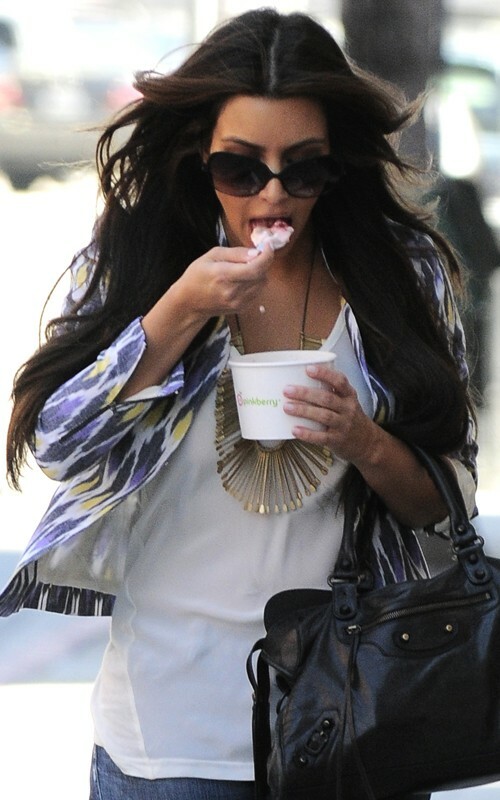 Afterward, in the pics below she is seen enjoying a huge cup of Pinkberry frozen yogurt! They recently opened one near me (finally) and it is a healthy alternative for when you have an ice cream craving! About Neil George, I just tried a sample of his Everyday Cleanse shampoo and the scent is divine! It is marked to smell like "orange blossoms", very fragrant and fresh. I'm definitely ordering a full size tube soon! Kim is carrying my fave Balenciaga bag right now, a black city! If you are shopping around for your first Bal and are unsure of what to get, then this is the one. You can never go wrong with this size and color. Perfection! To shop Kim's look, click here for similar sunglasses, here for similar jacket, here for similar tank, here for similar jeans, here for similar necklace, here for similar pumps, and here for similar bag.